Here is a message from Aaron Barkenhagen, Owner of Bootlegger’s Brewery regarding their victory in the Best Craft Beer of 2010 Poll. 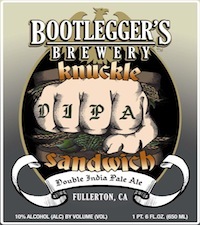 Bootlegger’s Brewery would like to thank all of you for voting Knuckle Sandwich DIPA the Best Craft Beer of 2010! We are very honored and grateful for all your continued support and kind words! Without our fans, friends, and supporters we wouldn’t be where we are today. Cheers to another year of brewing fresh, high quality beer (and Knuckle Sandwich)! Here is the link to the poll results! From TheFullPint.com: We would like to extend our congratulations to Bootlegger’s Brewery. Bootlegger’s happens to be in our backyard, and we got to watch the rise to success over the past 2 years. There were many amazing beers nominated for our poll, and Bootlegger’s vocal fanbase made it known to our world wide reader base that Knuckle Sandwich is an award winning beer worthy of your palate. If you make it out to So Cal for vacation, or if you live here in SoCal, you should do yourself a favor and try this beer.